The information boom of the last 15 years has given people a thirst for crate digging. What started on illicit pirate blogs has blossomed into a healthy industry of re-issue labels, and still, the race is on, to find the dustiest, mustiest rarity that no one has ever heard. Captured Tracks are drawing ahead of the pack, with their Shoegaze Archive series and now the Fantasy Memory imprint, curated by the seasoned vinyl archaeologist Andy Grier, of Thieves Like Us. This binge of eclectic listening has opened our ears to totally unknown movements like European coldwave, minimal synthesis, mutant disco, funk, and every permutation of world music. In this rich and ripe polycultural climate, perhaps we are finally ready to receive the worldbeat exoticism of Saâda Bonaire. Even after 15 years of listening to absolutely everything, Saâda Bonaire are entirely eclectic. The project began at a club night in Bremen as a pop-art project between DJ Ralph”“von” Richtoven and two vocalists, Stephanie Lange and Claudia Hossfeld. 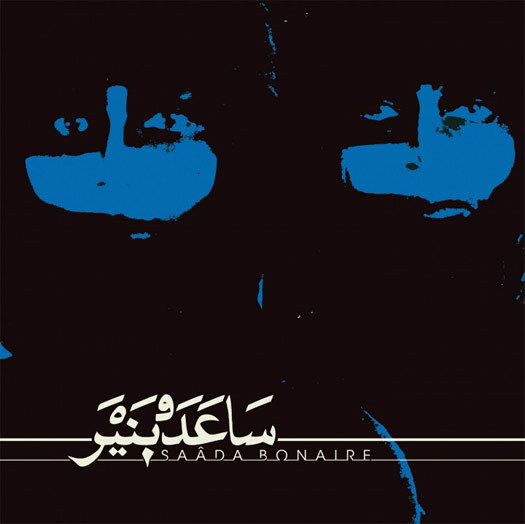 Inspired by the cross-cultural fusion of Afro-Caribbean music in America, and Rai and West African music in France, Saâda Bonaire sought to combine underground dance sounds of its day, 1982, with their own local flavor, Turkish and Kurdish folk music. They recorded the lead single, “You Can Be All That You Are”, which combines brittle synthpop and slippery digital funk with Middle Eastern instruments and detached, incantatory vocals. It’s a stone-eyed groove, perfect to transfix the intercontinental, and all was going well. Unfortunately, it was the only single the band would record. Their A&R man for EMI had a reputation for going over budget, had spent five times his allotment on Tina Turner’s Private Dancer, and was already three times overspent with Saâda Bonaire. EMI put out “You Can Be As You Are” b/w “Invitation” and pulled the plug, and the rest is history. While this backstory makes for compelling reading, and the cross-cultural pollination makes for some interesting, previously unheard combinations and critical interpretation, the question still stands: is the music good? Was it worth digging out? Saâda Bonaire is very much a product of its time, and while we seem to worship the ’80s recently, not every aspect of that decade has aged well. Some of the synths sound like Casio presets and the ubiquitous bass sounds like the Seinfeld theme song. This is digital funk, make no mistake, meant for discotheques and roller rinks. To make matters worse, sometimes that funk is met with skinny whiteboy reggae guitars, like on “Little Sister”, which sounds like The Police. There’s nothing inherently wrong with that, but the style has always been a little clean and sterile for my blood. Nonetheless, Saâda Bonaire possess the charm of the Private Press – creativity happening when no one’s looking. “Little Sister,” which I mentioned above, is a funk anthem to a younger sibling, with lines like “Don’t copy my hairdo/Don’t steal my makeup/Do not imitate me.” Lines many can probably relate to, with some high clear backing vocals as a bonus, but not likely to be found on the most recent chart-topper. It’s weird, but it’s a good thing. The joy of underground music is hearing things you haven’t heard before, wouldn’t have heard before. Art is as complex as life, and can reflect it all. Saâda Bonaire is for those who feel like they’ve heard it all, but are still looking for the next wonder. It’s for the mutants who are looking for every possible permutation; Germans dressed in hijabs, playing Turkish disco funk? Yes, please! Grab this one, to fill out your next mixtape, or get it on vinyl for your exotic DJ night.